So, when another strap to another one of my cheap bags broke on me at an inopportune time – it always happens when I’m doing a presentation and carrying lots of items – I decided to let a professional handle the bag making. Enter Jared DeSimio. 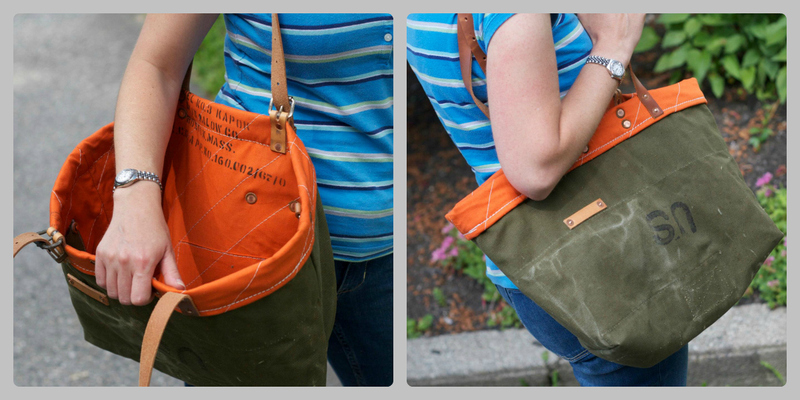 Jared is a native Maine and a self-taught maker of bags and accessories steeped in history. His pieces are handmade using vintage, antique, salvaged and upcycled materials. 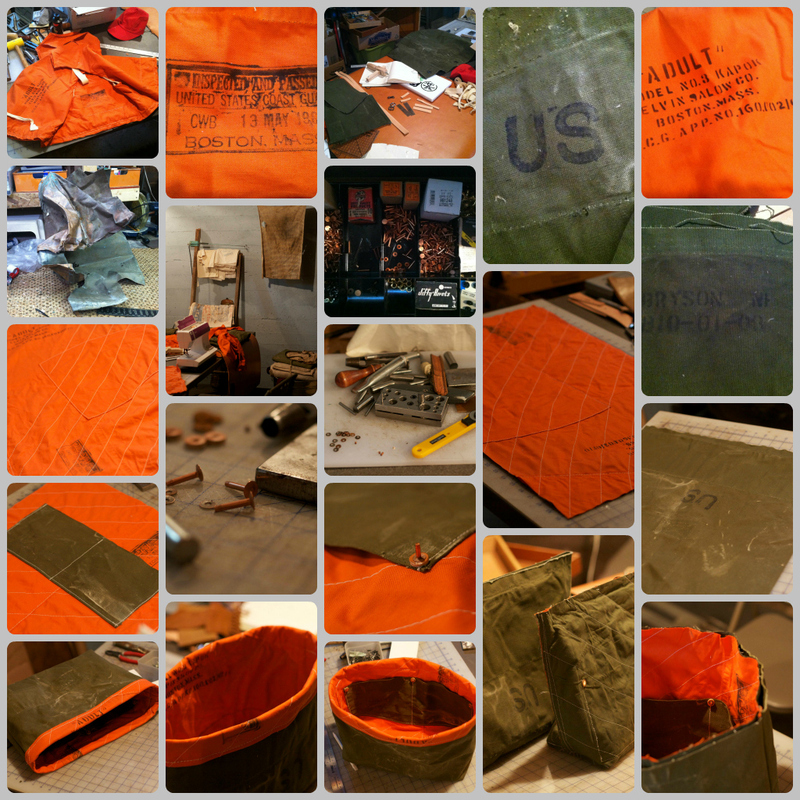 There’s certainly a green element to his bags, but they are much more than that because the materials he uses tell a story. It’s up to the user of the bag to keep the story going. Leather – 7oz. Vegetable tanned from Hermann Oak. North American steer, tanned in the USA. Treated with neatsfoot oil. According to Jared, the military duffle and the Coast Guard life vest were procured at flea markets here in Maine. The leather, rivets, and buckles were purchased on ebay, and the copper flashing was given to Jared by his father who found it behind an 1800s farmhouse. Here I am modeling off the bag. The final product. I love the detail on the outside with the upside down US. To me, it looks like SU, for my alma mater Syracuse University. Jared made sure the leather straps were the right size for my short self and that the pockets and key clip inside were on the proper side for a lefty. I love it. It’s comfortable to wear on my shoulder, and it could handle being stuffed with a ridiculous amount of business cards and swag at the BlogHer ’12 conference. And now for a giveaway. 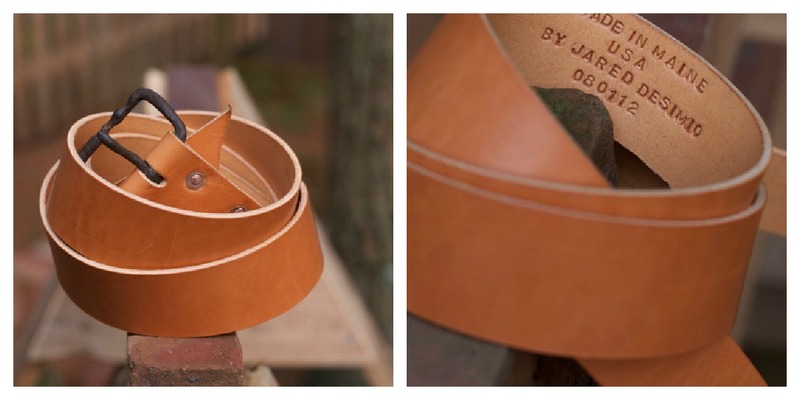 Jared is offering a custom cut and sized belt made from 10 oz. English bridle leather, which is sourced and tanned domestically. Here’s what the belt may look like. The buckle will be from antique horse tack. The rivets are vintage and domestically manufactured and the burrs are made from salvaged copper flashing. This belt can be made for a woman or a man and is guaranteed to fit since Jared is making it custom for you. All you need to do is enter below through Rafflecopter. The more steps you complete, the more entries you get. The winner will be randomly chosen by Rafflecopter. I will email the winner at the end of the contest (by 8/29/12) and connect the lucky person to Jared directly. Disclosure: Jared is a friend and made my bag in exchange for some marketing help. It was my idea to write the blog post, and the words, as per usual, are my own. Also, I wish I were eligible for the belt giveaway. I love local craftsmen and your bag is beautiful! The historical aspect of these pieces is very appealing- I found myself wondering what I could have made for the husband. Proceeding directly to Facebook to like Jared. He makes some great stuff and with all sorts of historic things! His etsy shop has some great bags made from seed bags. Very cool. Love your bag. We do alot of camping and outdoor activities plus I sometimes go with my husband when he goes flyfishing. Your bag would be perfect for carrying my books and notebooks. It would be perfect for you books and notebooks! Thanks for stopping by. You do great work Jared!